Santa Barbara prawns are sweet and oh-so tender. 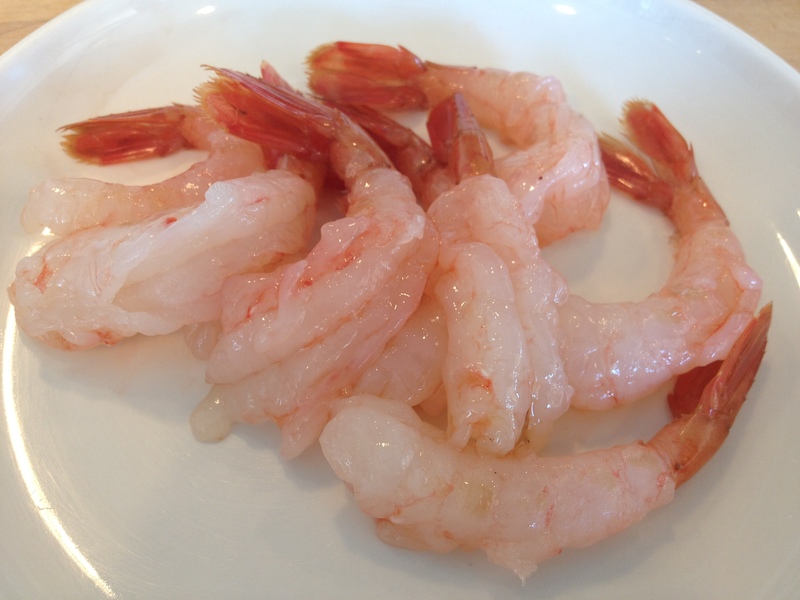 Despite their name Santa Barbara spot prawns (Pandalus platyceros) are not really prawns, per se. They are a type of shrimp. I generally understand the word prawn to mean a crustacean that’s larger than the average shrimp, with a slightly different shell structure and a more delicate flesh; I tend to think of spiny langostinos from the Mediterranean when I hear the word prawn. However, many people use the words prawn and shrimp interchangeably to mean any of these edible shrimp-like critters. I suppose peculiarities in name usage come from locality or availability. A jumbo shrimp cocktail, for instance, is referred to as a prawn cocktail in San Francisco, which is utterly indistinguishable from the chilled shrimp appetizer you’ll find from New York to San Diego. Why the regional variations in definition? I dunno, do your own deeper research if you like. Regardless of what you call them, Santa Barbara spot prawns (or just prawns, no spot) are incredibly sweet and tender. They are usually the freshest shrimp you’ll find on the West Coast; most shrimp have their heads removed and are flash-frozen close to the harvesting site (or at the farm, for farmed shrimp) as an enzyme in the head will cause rapid decay after they die. But SB prawns are sold live, which means they are super-fresh. It also means that to cook them you have to kill them, so if that gives you pause you may wish to cook something less visibly twitchy. For this recipe I sautéed a few of these über-fresh shrimp in a pan with some peeled and seeded tomatoes, some garlic, a handful of chopped herbs, and a touch of white wine. I ate it over some fragrant basmati rice and it was perfect. It’s a delicious preparation, but I also love them very simply grilled, head-on, split in half. 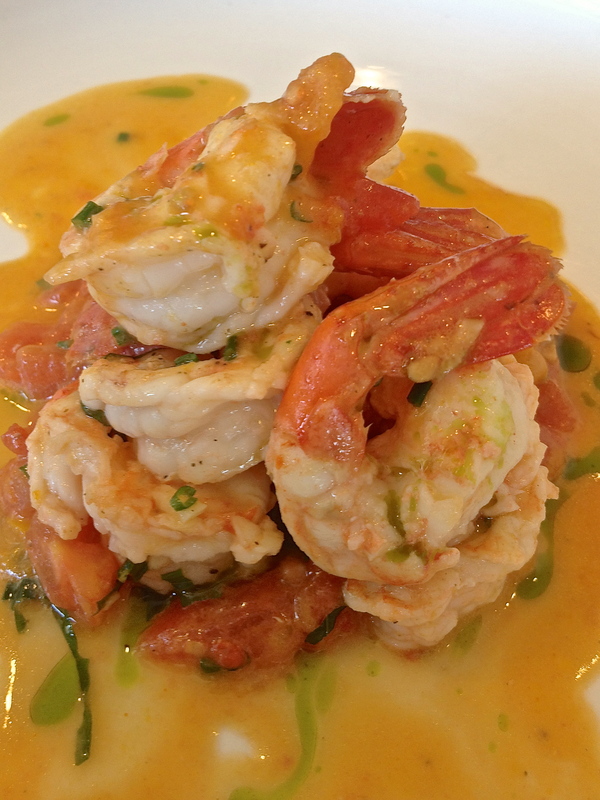 Be sure to also check out this earlier post about SB Prawns from about eighteen months ago. Sorry if the pics aren’t my finest. When you grill prawns it’s best to leave the head on and cut right down the length of the entire body with a sharp knife, while they’re still alive. I mean, that’s damn fresh! But if the idea of the legs and feelers frantically waving all over the place while you’re cutting them in half freaks you out (and it’s pretty freaky, I’ll admit), you can put them in the freezer for fifteen minutes, which will kill them in a slightly gentler fashion. 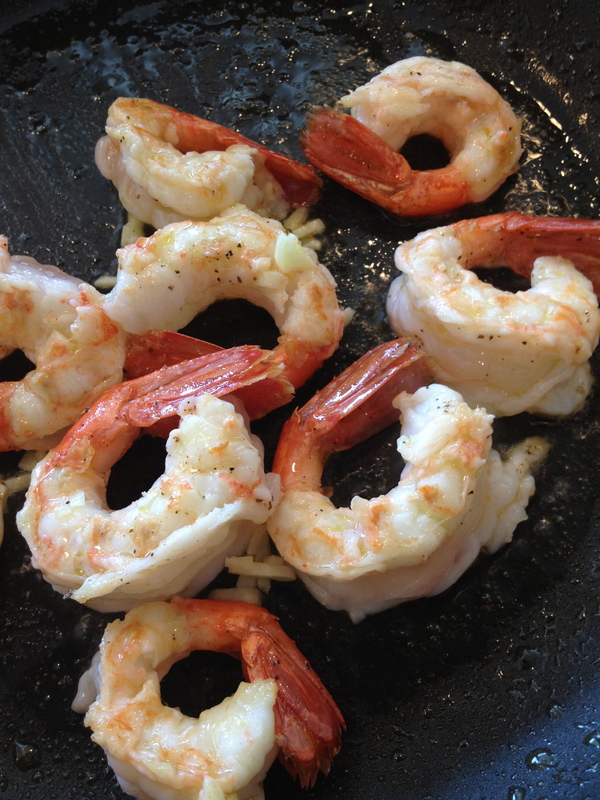 You’ll get less shrimp flailing when you break them down for cooking, whether you split them or clean them for sauté. Since I wasn’t using the heads for this preparation I twisted them off and discarded them. I peeled off the tail shell mostly, leaving just the ends on. I deveined the prawns and kept them chilled until I was ready to cook ’em up. This recipe calls for tomato concasse, which is diced peeled and seeded tomatoes. I used a lovely mixture of yellow and red heirlooms, which resulted in a fantastic orangey hue for the dish. To prepare tomatoes like this incise with a sharp knife an “X” on the bottom of each tomato (the top being the stem-end, btw) and dropping the tomatoes whole into boiling salted water for about ten seconds. Using a slotted spoon remove the tomatoes and place into a ice bath. The skin should curl back at the “X” and be easy to peel off. After you peel the tomato you can trim out the woody stem area, cut the tomatoes into segments, and gently scrape out the seeds. Chop into a medium dice for this recipe. This scampi-style dish takes almost no time to cook; just be sure to have everything ready to go when you sauté the prawns. And take care not to overcook the shrimp! Err on the side of undercooked, if you’re at all unclear. Always remember that things continue to cook off the heat, in the pan, in the sauce, on the plate. So especially for more delicate items like mild fish or these prawns remember to stop right before you think it’s totally cooked through. These little prawns have almost a “lobstery” flavor. This recipe is just for one person, so simply multiply the amounts for however many people you plan to feed. Heat a saute pan over medium heat for a couple of minutes. Add olive oil and 1 teaspoon of butter. Add prawns and season with some salt and pepper (use your own judgement). Cook prawns about 1 minute on the first side and flip them over. Add the garlic and the white wine. When the wine cooks down and no longer smells like booze add the diced tomatoes and herbs. Stir to coat the crustaceans and cook for about one minute, or until the shrimp are cooked through and the tomatoes are warm. Add another tablespoon of butter and toss the pan to combine everything. Remove from the pan and eat over rice or with toasty, crusty bread. The season is just about over. You have maybe two more weeks to get your hands on SB prawns. So go for it! Banana Pudding for all my friends!